The “B.U.I. 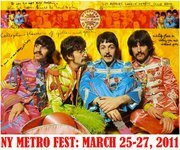 (Beatles Under The Influence)” musicians forum on Sunday afternoon is to be joined by a very special, previously-unannounced guest. Annie Haslam lead vocalist of the legendary British fusion band Renaissance – has just been added to the lineup and will join musicians Gary Wright, Mark Hudson, Joey Molland, Mark Rivera and forum creator/moderator Martin Lewis in an informal conversation and jam session celebrating the myriad musical influences that shaped the Beatles. Annie’s brother, the late Michael Haslam, was a ballad singer managed by Beatles manager Brian Epstein in the early 1960s – he performed at the Beatles Christmas shows 1964-1965. Posted March 17th, 2011 in News.